Latest news…. now that Gnomes Unearthed has finished all the sculptures are heading off to various sites. My Gnomey will find its new home at The Mulberry Centre, a cancer care unit at West Middlesex University Hospital, Isleworth, Middlesex. It will be on show in the foyer of the unit. It is hoped that Gnomey will be auctioned to raise funds for the Mulberry Centre in 2017. After the success of The Big Hoot, I had been invited to take part in another Wild in Art project, at Hampton Court Palace. A community project involving fifteen sculptures celebrating the 500th anniversary of the palace will be created. I collaborated with Trinjan Women’s Social Group from Hounslow (my hometown!) to create ideas and designs for our sculpture. 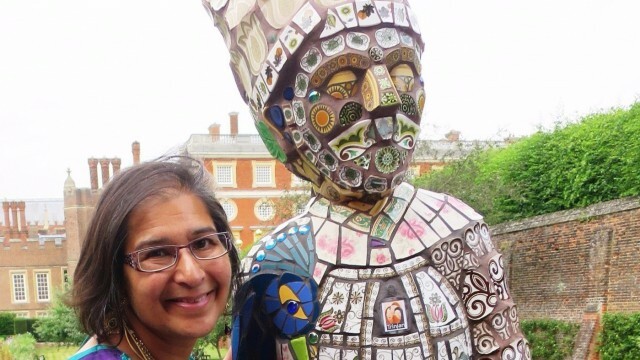 I was commissioned by Hampton Court Palace and Wild in Art to mosaic the figure from the participants inspirations from their visits to the amazing venue. The exhibition was on show from 21 July to 2 Oct 2016.